Thomson Reuters is pleased to announce the appointment of Dr Joanna Howe as co-Editor of the Work and Employment section in the Australian Journal of Administrative Law. Dr Joanna Howe is a Lecturer of Law at the University of Adelaide and a consultant with Harmers Workplace Lawyers. She holds a Doctorate of Philosophy in Law from the University of Oxford where she studied as a Rhodes Scholar. She completed her Bachelor of Laws with first class honours from the University of Sydney. She has also worked as a consultant for the International Labour Organisation in Geneva and conducted a research project for the Equal Opportunities for Women in the Workplace Agency. Her current research interests lie in the regulation of temporary migrant work, unfair dismissal law and adoption law. 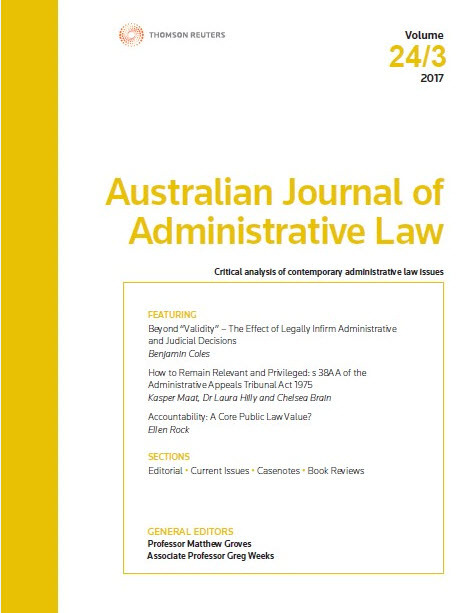 Dr Howe’s contributions will be of great benefit to readers of Australian Journal of Administrative Law and we take great pleasure in welcoming her to the team. Stay tuned or follow us on Twitter for more news from our Journals portfolio.